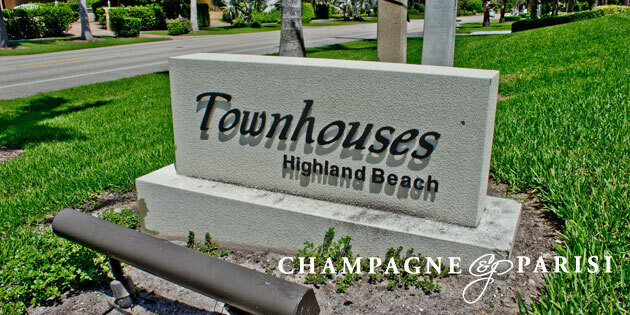 Townhouses of Highland Beach is a unique luxury community situated between the Intracoastal Waterway and Atlantic Ocean in the beautiful town of Highland Beach. Two waterfront buildings of two-story townhome style condominiums comprise the Townhouses of Highland Beach community, giving residents a spacious living area right near one of Florida’s finest beaches. The newly renovated townhomes ranging in size from 2,000 square feet to 4,000 square feet feature incredible upgrades that are sure to meet all of your needs. Some of these features include hurricane impact glass floor to ceiling windows, large kitchens with granite countertops, top notch appliances, crown molding, custom lighting, oversized master bedrooms, and walk-in closets. Not to mention, wrap around balconies allowing residents panoramic views of the ocean, tropical landscaping, and surrounding city skyline.